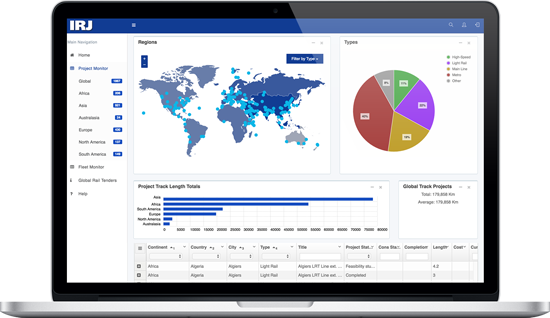 IRJ Pro is a comprehensive business intelligence toolkit for rail professionals, providing a unique perspective on market dynamics in the global railway industry. Whatever your sector or target market, IRJ Pro gives you a clear and up-to-date picture of investment in new railways and rolling stock. Pinpoint developments in the markets that matter to your business with IRJ Pro’s searchable datasets. Create customised datasets for your own analysis. The data behind IRJ Pro is powered by International Railway Journal. With a breadth of experience and knowledge spanning over 50 years, you can rely on us to help gain an insight to the ever-changing rail industry. Ensure you stay ahead within a fast-moving and dynamic industry. 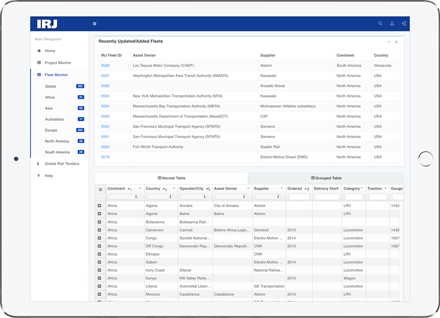 IRJ Pro’s comprehensive data sets are continuously updated to keep you informed so you have what you need, when you need it. What does each service offer? A worldwide index of all known locomotive and passenger rolling stock orders placed since 2012. Listing parameters such as: operator, owner, supplier, type and many more. Technical specifications provided where possible. Details of all known railway construction projects around the globe, offering a unique perspective on infrastructure investment at local, national, regional, and global levels. Project profiles and contractor information are provided where available. Seize business opportunities straight from your inbox. Search current railway tenders worldwide and receive bespoke email alerts based on your preferences.